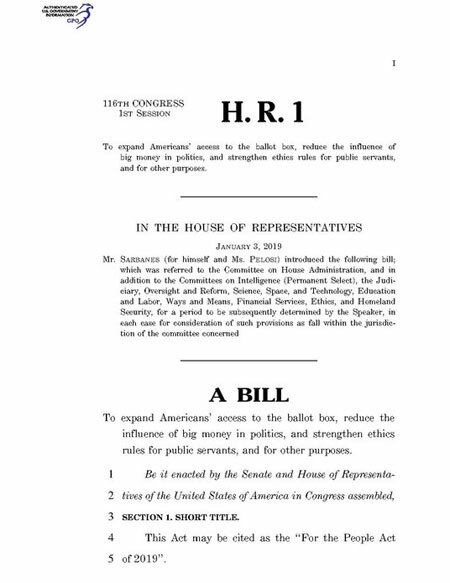 H.R.1 – For the People Act of 2019 was introduced into the House of Representatives on January 3, 2019 by Rep. John P. Sarbanes, [D-MD-3] and has well over 200 Democrat co-sponsors. Scan the legislation and consider the questions below. What main sections are contained in the text of H.R.1 – For the People Act of 2019? What actions have been taken on the legislation? What committees are reviewing the legislation? Which aspects of the legislation are under the purview of which committee? Read some news articles covering the introduction of the bill and evaluate how well they summarized the bill text. What features of the bill does each article discuss? Compare and contrast the information presented by each article. What do you notice? Compare the summary of different issues represented in the articles with the actual text of the bill. Using evidence from the text, discuss how accurate the reporting of each article was. Did each article provide sufficient information for citizens to get the basic gist of the bill? Explain your response. What more did you learn about the bill? Which argument did you find particularly compelling? Why? What else would you have liked them to address? What commentary would you have added? What rebuttal would you have made (to whom)? What questions would you have liked to ask (to whom)? Which reforms do you support and which do you oppose? What is the reasoning for your support or opposition? Choose at least one reform and write a letter to your representative advocating for the support of or opposition to the reform(s).